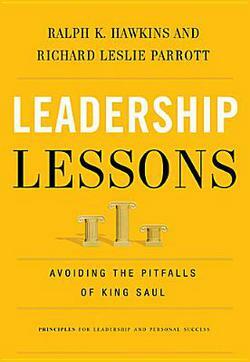 Leadership Lessons, by Ralph Hawkins and Richard Leslie Parrott is a case study about the failure of King Saul. The authors raise need at the beginning of their book by providing a biblical rationale for studying a failed leader. Colin Powell reveals the test of leadership failure: “The day soldiers stop bringing you their problems is the day you stop being their leader. They have either lost confidence that you can help them or concluded that you do not care.” Leadership Lessons helps prevent Secretary Powell against. These ten leadership failures capture the essence of Saul’s life and his failure as the King of Israel. The authors are to be commended for excavating these failures and warning readers from committing the same sins in their sphere of influence. The third section discusses ways to avoid the pitfalls of King Saul and his leadership failures. Boiled down, the authors argue that Saul’s failure can motivate and aspire leaders to excel in their respective arenas. In other words, leaders can learn from Saul’s mistakes. Leadership Lessons is filled with practical tips for serving people with humility. One criticism that must be noted is the propensity to turn Saul’s sin into a personality disorder. Whenever one promotes the notion of “personality disorder” the next step is some form of “therapy” to remedy that personality disorder. But in Saul’s case, his leadership failure was the result of sin. It was sin that led him down a path that ultimately destroyed his rule and reign. It was sin that led to his untimely death. And the cure for sin is not therapy. The cure for is the gospel of Jesus Christ. My hope is that leaders will benefit from this book. Much can be learned from the sinful example of King Saul. So much more can be gained by grounding our leadership is the saving message of the gospel of Jesus Christ!